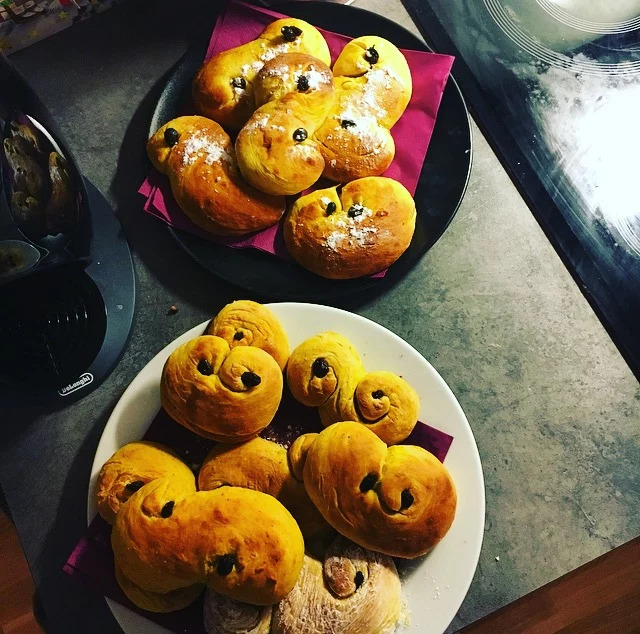 I just love December in Scandinavia because I get to bake these delicious saffron buns to celebrate Saint Lucia on the 13th of December! If you are not familiar with them you should definitely try them at least once, you will love them! Mix together milk and butter, pour the yeast into a small bowl, add a little water and mix it together, when it start to make bubbles pour it into the milk and butter mixture. Keep on stiring and add flour, sugar, salt and saffron, mix until the dough looks smooth, after that let it rise in a warm and calm environment. I usually put a damp towel on top of it and place it in the oven. Let it rise until the dough gets twice as big ( at least 45 minutes). After that create these S shaped buns, add two raising on the sides and brush with egg yolk. Heat up the oven to 250 C and bake for 5-8 minutes!